Fitness Savvy looked online and discovered 316 online user reviews of the NordicTrack C990. Overall, this treadmill scored a disappointing 3.4 out of 5. Nevertheless, in true Fitness Savvy fashion, we’ve provided all the juicy info you need, as well as including useful videos, product specs, and user manuals. However, if the scores and reviews have put you off, and you’re looking for a treadmill of similar cost, you can always head over and check out our treadmills category page. You can compare ratings on hundreds of models and find a similar model, with a better rating if you prefer, and then compare prices and find discount codes and deals, too. FlexSelect cushioning: change the cushioning between firm and cushioned. 7″ HD Smart console: a high-definition console for detailed workout feedback. 32 pre-set workout programmes: achieve a wide range of fitness goals with the pre-set workouts. Foldable: easy folding mechanism allows space-saving storage. 0 – 12% Incline: add intensity to your exercise routine with steeper incline levels. iPod compatible: connect your iPod or other MP3 devices. Tablet shelf: use your tablet or iPad to watch videos or listen to music while you run. iFit enabled: take to the streets of world cities. Note, that at the time of writing, iFit requires a monthly subscription that many report as being expensive. However, there are other apps which do a similar thing which can be used. OneTouch controls: easily adjust incline and speed with these easy access buttons. 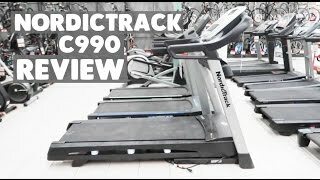 When looking for the best price on the NordicTrack C990, you should make Fitness Savvy your first stop. This product appears to be available from Amazon, eBay and Fitness Superstore. Prices change daily, so be sure to check back with Fitness Savvy before making your purchase. 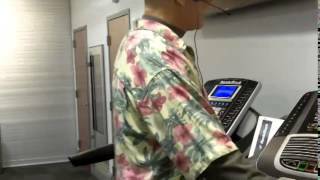 Many people are interested in how the ProForm Power 995i and NordicTrack C990 compare. Below we’ve highlighted some of the key differences to help you decide which is right for you. To be fair, the ProForm Power 995i is a clear winner, so certainly something you should check out before buying. In case you’ve lost your copy, or want to check it out before you buy, here is a link to the NordicTrack C990 manual PDF. It includes the assembly guide, parts list and general set up instructions.